For a party that rode to power on the plank of development, one would imagine that the Modi administration would listen to the people and offer pragmatic solutions to the problems we face in India today. Unfortunately, after coming to power the PM has seldom attempted to listen to people. His attendance in the Parliament has been very poor and he has not answered the questions posed to him by the opposition. He has neither held a candid press conference since 2014. Yet, Modi strangely observed a ‘black day’ to mark the declaration of the emergency four decades ago. He ironically harped on the tenets of democracy, even though his is perhaps the opaquest government in Indian history. However, it isn’t only the concept of democracy that the Modi administration is confused about. They seem oblivious of the meaning of development and progress, the two key words that they used ad nauseum during the 2014 elections. Despite examples galore, one must look at the response to the police brutality in Thoothukudi last month in which 13 people lost their lives. The otherwise social media savvy Prime Minister has maintained a shrill silence over the tragic killings. When asked about why the PM hasn’t shared his thoughts on the police firing, union minister Nirmala Sitharaman, said on June 9th that she ‘will ask and tell’. There hasn’t been a word either from her or from the PM on this matter since. As if to rub salt into the wounds of some of those protesting against and the others pleading the government to ensure their right to life is not violated in the name of ‘development’, the PM took time out to make a video about his exercise routine. Supposedly the purpose of the video was to encourage people to have a healthy life style. 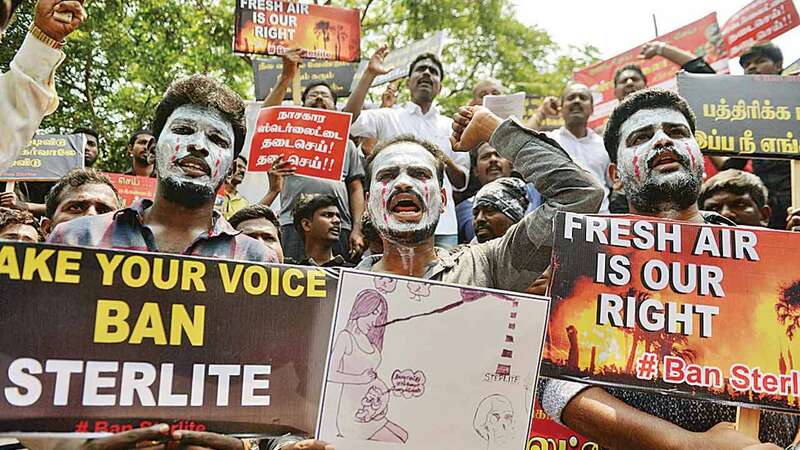 Yet, when the people in Thoothukudi have been protesting for long that their health was being destroyed by the carcinogenic materials being released by Sterlite, the PM was and remains unmoved. The contamination of water and air has resulted in many villagers being afflicted by caner, skin diseases, infertility, and miscarriages amongst scores of other health problems attributed to the pollution caused by the ‘development’. How many people must die, before the PM breaks his silence, or how many years must pass before he observes another ‘black day’, should there be an industrial tragedy like in Bhopal? The few noises regarding the matter that are being made are by influential Godmen (who are seen as being close to the PM) like Ramdev Baba and Jaggi Vasudev, who claims that “lynching large scale business is economic suicide”. As has become the wont of this government, they have subtly attempted to strike the ‘nationalism’ chord by claiming that “India has immense use for copper. If we don’t produce our own, of course we will buy from China’. Many people on social media seem to subscribe to the view that India must be self sufficient so that we become a strong nation. They fail to understand that autarky is not pragmatic in a globalized world and only the likes of North Korea attempt to attain it. Even if one were to purely consider the national interest, it would be better to import the copper from China, because they will help us retain our environmental wealth. Of course, even this is a myopic view as the catastrophes that result from environmental damage, know no national/political boundaries. Thus, if the PM truly intends to safeguard democracy, he must start listening to people and looking for solutions that people expect the government to provide. Exercise videos may be light hearted, but the government cannot lose sight of the real problems. It cannot ignore the safety and future of people, especially of those who are poor and marginalized. Plush buildings in cities is not what development is about. Real development is inclusive and sustainable. Hope the PM corrects his views.